"Divertimento," a new composition by Viatcheslav Semionov of Moscow has been released by Ernest Deffner Publications of New York. This exciting work is written in three movements, (1) Legend (2) Nostalgia (3) Journey, is for instruments with both stradella and free bass. It is playable on either piano accordion (minimum 41 key) or chromatic accordion. The composition is a skillfully-written work adaptable to different systems. 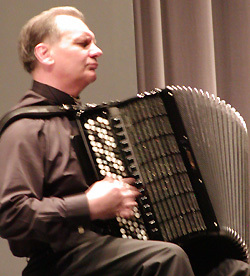 Semionov's broad knowledge of systems is apparent because he has distinguished himself as the teacher of prize-winning accordionists performing on either chromatic and piano accordions. The composer encourages accordionists to perform this work on various accordion systems. As one of Russia's foremost accordionists and composers, Viatcheslav Semionov is widely considered "the founder of the modern performance school of bayan." He was awarded the Silver Disk at the 1994 International Festival of Bayan and Bayanists and in 1995, he received Russia's highest performance distinction, "People's Artist of Russia" as decreed by President Boris Yeltsin. 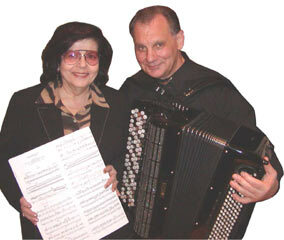 The foreword of Semionov's new work is a dedication which reads: "Written for my colleague Faithe Deffner in commemoration of her service to the accordion community as President of The American Accordionists' Association: 1985-1986, 1995-1996, 1997-1998 and 1999-2000. Semionov at the premiere performance.